Between May 2001 and May 2002, 39 percent of the American workforce changed jobs. In 2000, 76.8 percent of women aged 25 to 54 worked outside the home. The divorce rate hovers at 50 percent. Union membership is down 33 percent since 1983. Women's earnings relative to men's have stagnated at 73.2 percent. The percentage of births to single mothers (out of all mothers) has risen from 10 percent in 1970 to 33 percent today. 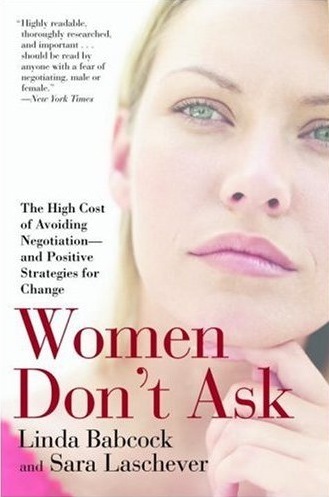 In surveys, 2.5 times more women than men said they feel "a great deal of apprehension" about negotiating. When asked to pick metaphors for the process of negotiating, men picked "winning a ballgame" and a "wrestling match," while women picked "going to the dentist." Women will pay as much as $1,353 to avoid negotiating the price of a car, which may help explain why 63 percent of Saturn car buyers are women. Women are more pessimistic about the how much is available when they do negotiate and so they typically ask for and get less when they do negotiateon average, 30 percent less than men. By not negotiating a first salary, an individual stands to lose more than $500,000 by age 60and men are more than four times as likely as women to negotiate a first salary. In one study, eight times as many men as women graduating with master's degrees from Carnegie Mellon negotiated their salaries. The men who negotiated were able to increase their starting salaries by an average of 7.4 percent, or about $4,000. In the same study, men's starting salaries were about $4,000 higher than the women's on average, suggesting that the gender gap between men and women might have been closed if more of the women had negotiated their starting salaries. Another study calculated that women who consistently negotiate their salary increases earn at least $1 million more during their careers than women who don't. In 2001 in the U.S. women held only 2.5 percent of the top jobs at American companies and only 10.9 percent of the board of directors' seats at Fortune 1000 companies. Women own about 40 percent of all businesses in the U.S. but receive only 2.3 percent of the available equity capital needed for growth. Male-owned companies receive the other 97.7. percent. Many women are so grateful to be offered a job that they accept what they are offered and don't negotiate their salaries. Women often don't know the market value of their work: Women report salary expectations between 3 and 32 percent lower than those of men for the same jobs; men expect to earn 13 percent more than women during their first year of full-time work and 32 percent more at their career peaks.